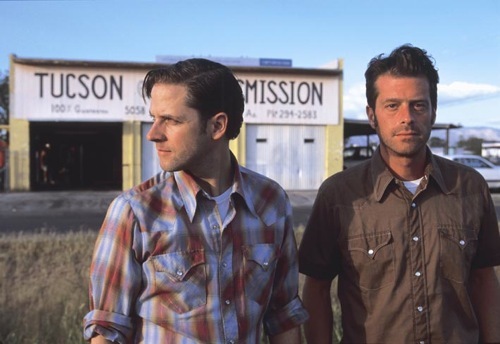 Now a decade into their career, Tucson’s Calexico continue to cull their sound from the surrounding deserts. Just as their name implies, that sound is equally rooted in California and Mexico – border-hopping back and forth – absorbing whichever styles that happen to be pulled in by their ever-widening wake. 2006’s Garden Ruin was greeted with equal parts exuberance and a fear that the group had abandoned its southwestern identity. Carried to Dust, out September 9th, finds the group headed back to their spiritual home, though not forgetting the lessons they learned along the way. As Joey Burns (himself de facto leader of the group, alongside drummer John Covertino) said during our conversation, Calexico make traveling music, and they can’t be blamed for wanting to take a few detours. After all, you never really understand your home until you leave it behind. AD recently caught up with Burns to discuss, among other things, his band’s creative trajectory, the Minutemen, and the advantages of travel. Aquarium Drunkard: The last time I saw you was backstage at Newport a few weeks ago. What have you been up to since then? Joey Burns: Oh, that’s right. Well, let’s see, we’ve been working in the studio a little bit. We’ve recorded a couple of songs — I guess you could call them cover songs. One’s for Chris Gaffney, who was in the Hacienda Brothers. His friend Dave Alvin is putting together this compilation that’s memorializing him [note: Gaffney died in April of 2008 of liver cancer]. We did a song called “Frank’s Tavern” for that. And we also did a song for this Dutch band called De Kist, a song called “Oe.” We did some rehearsing with a French singer named Françoise Breut; she was in Tucson this past week, and we did a couple shows with her. We recorded a Nina Simone song with her, “Keeper of the Flame.” We’re working on a movie soundtrack to Love Ranch, and we just finished the first piece of music for that. And we’ve done a bunch of interviews and are trying to stay sane in the process. AD: When do you guys hit the road? JB: On August 31st I start doing promo by myself and John joins me three days later and we’ll do a couple of showcases over in Europe and tons more interviews. AD: You’re from southern California, correct? AD: I’ve read that you were a big Minutemen fan growing up. What did that band’s openness do for you when you were starting out? JB: It was pretty important. They stood for a lot of things; I think that they were incredible players in their own right, but they were also pretty eclectic as a band. Their music changed all the time. It was free jazz, full-on punk rock songs, songs like “Corona” that were somewhat inspired by going down to Mexico and sound like a polka or a Mexican folk song or a Norteî±o song but lyrically it’s…it’s so D. Boon. I liked the fact that a lot of the lyrics read like a journal. They were experimental and had these esoteric bits and philosophical moments, socio-political commentary, and at the same time they talked about the scene that they came from, and about being from Pedro, and driving north to Hollywood to go pogo. I just loved the heart-on-their-sleeves attitude, and they had a strong work ethic, and I can identify with that. AD: Yeah, I’d say so. AD: The Minutemen were obviously very close to their fans. You guys have a habit of putting out tour-only LPs, which most bands don’t do. AD: Yeah, I mean, some may do an EP, but you guys have several full-lengths. JB: I haven’t really paid much attention. Sometimes I’ll get someone’s tour CD or something. But I guess we’ve done it consistently. It’s fun. Those are great, because the pressure’s off. We can go in and see what happens. [You can go in to the studio] and just do something trippy, see what happens. And hopefully you don’t get too many returns at the next concert. “Hey, you guys were here, and I bought this Toolbox thing, and I can’t stand this. I want my money back.” (laughs) Nah, so far, we’ve been lucky. AD: I want to talk about Garden Ruin for a minute. That record is obviously a pretty big leap for you guys stylistically. One of the things that Carried to Dust is being praised for is its return to form. But when I listen to the new record, I hear a similar refinement to the songs here that I think is leftover from Garden Ruin, sort of like you guys took the lessons you learned making Garden Ruin and applied them to the “classic” Calexico sound. Do you think it was necessary to make a record like Garden Ruin to move Calexico forward artistically? JB: That’s a good question; no one’s asked that. We were just following intuition, whether it was The Black Light, or Hot Rail, or Feast of Wire, or Garden Ruin, or even the new one. You’ve just got to listen to where it is that you are and instead of trying to really plan things out in advance — which is probably a good thing to do, I’m sure a lot of people do that — we tend to just stumble in to the back entrance of records and start making sounds in the studio instead of writing outside of the studio. We just go in and start making some noise, and it has its disadvantages at times. We have a lot of material to sift through later on. But we try to hone it in on that which we like pretty soon. To answer your question really honestly, we generally wanted to mix things up; we didn’t want to repeat ourselves because we felt like we’d gone so far doing this one technique of recording and mixing. And our mixing engineer even suggested to us that we should work with J.D. Foster to see what he could offer us. We’d been talking about it and he suggested it, so we did. And J.D. really suggested working with Andy Taub, who’s a great mixing engineer, and we gave them the green light. So then the vocals came out louder and on top of the mix which is unusual for our past records. [People] got hung up on the production, just the mixing. It was recorded in the same studio, Wavelab. It’s all the same musicians and instruments, and even similar songs, I think; it was just mixed differently. AD: It feels a bit poppier. JB: Yeah, some of those songs have that tendency. Songs like “Lucky Dime” or “Bisbee Blue” have that pop-rock orientation. But they’re not, like — I’ve heard people say, “Oh, it’s mainstream.” I’m like, “You’ve got to be kidding me.” (laughs) It’s more usual to what you might hear from our band, and what I think was really nice was that the negative comments were really a compliment to our eclectic and diverse style and sound and mixes and production. So it was nice; it was a nice compliment. So I think that having done that, we thought, well, let’s keep things low budget. Because times are tough, and no one knows how long people can put out records and still get by, because it’s very hard. The Internet and illegal downloads make it tough for people to put out records, and that’s a fact. Or, at least, records of certain quality. And it involves a lot of people, too. So we did it really stripped down, kind of like we did at the beginning, when we were really watching the budget. It was a good lesson in stripping down and stripping all of the layers and starting with the basic elements. Then we brought in the rest of the band from Europe, Nashville, and locally, as well as guests from around the country, and we’re able to do that now through Internet, which keeps costs down, too. AD: So you recorded a lot of the guests via the Internet? JB: Sometimes, yeah. Like with Sam Beam we did that, we did it with Amapro Sanchez. Mickey Raphael, from Willie Nelson’s band — they were in town, and [Mickey] was just hanging around the studio and wanted to play. He was like, “Give me some more songs to play on,” and we were like, “Mickey, come on, man. You’re killing me. I wanna record you, but can you play the bass harmonica?” And he says, “Of course!” and he goes to the tour bus and comes back with his special bag of harmonicas. What a spectacular player; we had so much fun. And then Pieta Brown was passing through town and Jairo Zavala was here in Tucson making his record — a project called The Pedro, with us — so it was only natural to have him play on the record. AD: Is that him singing on “Inspiraciî³n”? JB: No, that’s Jacob. Jacob’s in the band and that’s him on that song. No, Jairo’s playing on the first track, “Victor Jara’s Hands.” He’s a phenomenal musician, as is Jacob. It felt right to open this up a little bit and to allow these friends of ours to sit in. It’s reflective of how we do things on the road and I wanted this record to be as close as it could be, and it’s hard to do, to capture what we do live. The energy, the spontaneity. Hopefully there are parts that shine through. I really do look at albums and studios as a completely different environment as the live show. Everything is quietly recorded and performed, then mixed to sound big, but you’re hearing every little nuance when you’re recording. Whereas on stage you can sneeze really loudly and no one would hear you. Everything is infinitely amplified. It’s a different dynamic, and it’s changed the way that our band performs live. AD: Usually bands that bring in several guests on a record tend to lose their own identity in the process; is it hard to maintain your own vision while taking their suggestions to mind? JB: I think it’s pretty easy. The part that Sam’s singing on is more of a backing vocal part, and Mickey’s part got edited down a bit. When Pieta Brown came in to sing, I’d written the song a couple of nights before, and I thought that the melody was reminiscent of and Iron & Wine track. So I checked with John, who knows Sam’s work better, and he said it sounded good. And when Pieta came in, I had this very specific melody, which I thought would be good for a change, having this familiar melody that doesn’t change. The first thing she says is, “Do you mind if I make it my own?” And I said, “Of course, please do.” Everyone’s making it their own, but in doing so it only strengthens that living, breathing aspect of the ensemble. Sure, there’s John and I and [engineer] Craig Schumaker making all of the decisions and shaping it, and it then becomes unified. It congeals at that last stage of the process. AD: You’ve said before that your European tours are much more successful than your American ones. JB: Yeah, they help fund the tours over here. AD: It seems that Europeans have this weird obsession with classically American music. You guys are very popular there, My Morning Jacket found their earliest success in Holland, and the entire alt-country scene is huge there. What is it about that sort-of gritty Americanism that appeals to them? JB: I think they like all aspects; they’re into the major stuff, too. They like mainstream pop culture from America. UK culture is big, too. Maybe some of these smaller acts, or some of these areas in Europe, they connect with certain bands and artists for any number of reasons — their upbringing, their television programming from when they were children. Maybe in the 80s there was a lot of classic American film being shown over there on television, who knows? I was talking about this earlier today, how the grass is greener on the other side, and that can make it appealing to want to see a band that’s from a region that they’ve heard about or have seen in a film. And we’re not playing to hundreds of thousands of people or anything; we’re playing modestly sized places. And the festivals are fun, they expose you to a wider audience, and festivals in general are way more open-minded in their programming. AD: The press material for Carried to Dust says that the record is about a Los Angeles writer during the writer’s strike who goes out into the world, traveling and having all of these experiences, using his time off to take risks, and somewhere in the middle of all of that, he’s enlightened and discovers a new sense of freedom in his work. Not for nothing, but it sounds like this guy is a member of Calexico. Great interview. Austin Lucas also has a pretty big following in Europe. And it is available now! You can choose to buy from stores which are VeriSupport certified and ranked ensuring that you are protected from online breeches and fraudulent organizations. Look for the VeriSupport seal when you buy from an online store, as VeriSupport seal in a website tells you, the organizations ability to provide support like live customer service, technical support and other helpdesk functions before, during and after the sale; the ability to handle customer feedback and their reliability as a company. 2. You have the power to comment and rate in real-time about your experience. VeriSupport helps your visualize support levels of the organization that you could deal with! and now its your decision choose VeriSupport certified organization for a hassle free experience! Look for the VeriSupport seal provided by VeriSupport.Com, every time! Watch One Piece Episode 7 Online!